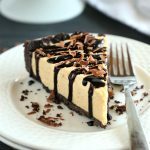 This Frozen Chocolate Peanut Butter Cheesecake Pie is the best ultra-creamy summer dessert for chocolate and peanut butter lovers! Combine the Oreo cookie crumbs and the melted butter in a medium bowl with a fork. Pour the mixture into a 9-inch spring form pan and press into the bottom to form a crust. Press some of the mixture up the sides, if desired, as well. Set the crust aside while you make the filling. In a large bowl, whip the cream cheese with a hand mixer until nice and creamy. Add the powdered sugar a little at a time, mixing well until it's completely integrated. Whip in the peanut butter, scraping down the sides of the bowl to make sure everything is evenly incorporated. Gently fold in the whipped cream (be sure to whip it to stiff peaks first!) with a rubber spatula. Dollop the mixture into the spring form pan over the Oreo crust and smooth it out as best you can. Place in the freeze for 6 hours or overnight. Remove from the freezer for 20 minutes before slicing and serving. Slice with a hot knife for nice clean slices and garnish each slice with a drizzle of chocolate sauce and some shaved dark chocolate. If you'd prefer to use whipped topping in this recipe instead of full fat whipped cream, simply use the same amount of whipped topping and reduce the powdered sugar to 1/2 cup. This recipe can be made several days ahead of time and stored in the freezer. Simple remove from the freezer 20 minutes before slicing and serving as the recipe directs.